A review in 10 words (or thereabouts): Oceans Eleven with a bunch of teenagers. Basically. Kat Bishop was enjoying her stay at a prestigious boarding school. She was enjoying a normal life. But when an old friend plans her expulsion, Kat once again finds herself on the outside looking in. 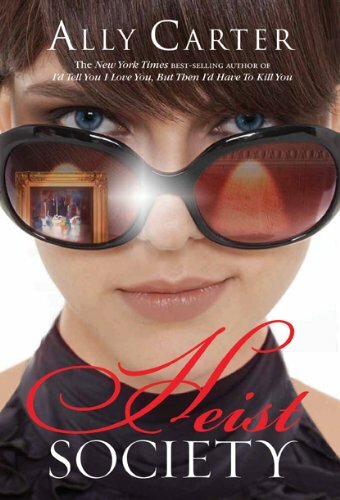 A mob boss is hunting down her father after some precious, expensive paintings come up missing in his mansion estate and Kat must use the skills she learned as a young girl to find the paintings are return them before time runs out. I was a huge fan of the Oceans Eleven franchise, so much to my pleasure this felt like a teen versio nof that same tale. Incidentally, that's what made it a wee bit disturbing...teenage thieves...but the characters were fun, the story had equal parts emotion and thrills, and the heist was well planned and exciting. Much like the Oceans Eleven movies, I wish a few more hints had been dropped throughout so that you, as the reader, could play along. Don't tell me what you're going to do, but tell me what you're going to do. Overall, I really enjoyed the first in this series by Ally Carter. I can't wait to read the next two and get to know Kat, Hale, and the gang a little better.